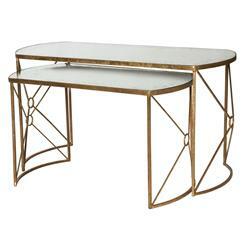 Intriguing antique gold mirror nesting tables bring twice the Hollywood glamour. Finished in antique gold, these mirrored tables can be used together to set a stunning buffet. Separately, they complement each other and enhance any romantic, vintage setting.